Thus Benedict XVI underlined the “ecumenical” teaching of Jesus in our time: “Church members should not feel jealous, but rejoice if someone from outside the community do good in the name of Christ, provided this is done with right intention and with respect “. At the same time, he insisted that often jealousy and the desire to block the action of someone also exist within the Church: “Even within the Church itself – he added – it can sometimes happen that one can have difficulty in appreciating and recognizing, in a spirit of profound communion, the good things done by the various ecclesial realities. Instead we should all be able to always appreciate and respect each other, praising the Lord for the infinite ‘fantasy’ with which he acts in the Church and in the world”. The pope also commented on the second reading of today’s Mass, taken from the Letter of St. James, which concerns “the invective… against the dishonest rich, who put their trust in the riches accumulated by dint of abuse” (cf. Jas 5.1 to 6). The pope also bid farewell to the faithful at Castel Gandolfo, because tomorrow he returns to take up residency in the Vatican. This may of course come as a great shock to those within the Church who believe differently! The Jewish Feast of the Tabernacle, Sukkot, begins at sundown on Sept. 30, 2012, and ends at nightfall on Oct. 7. The Festival of Booths, as Sukkot is also known, is observed from the 15th to the 21st of the Tishrei in the Jewish year of 5773. Divine Liturgy at all Churches on Sunday 30 September will prepare the faithful for the three day fasting and prayers. It will begin on Monday 1st October, continue on Tuesday 2nd October and will end on Wednesday 3rd of October 2012. 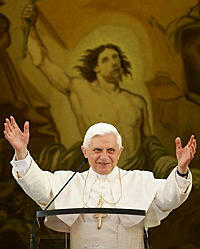 The Church has requested one all to pray and fast for the complete success of the Papal elections. I certainly hope it goes better for them than it has with the deadlocked Canterbury Anglicans. A Church of England panel meeting in secret to choose the next Archbishop of Canterbury has failed to reach agreement on who should be the new leader of the world’s 80 million Anglicans, a newspaper reported on Sunday. After three days of talks behind closed doors in an undisclosed location, officials narrowed the field to three candidates, but will need to meet again to finish the job, the Sunday Times said, citing an unnamed senior cleric. The choice of a replacement for Rowan Williams, who steps down in December, is critical for a church in danger of splitting over divisive issues such as gay marriage and senior women clergy, and facing a rising threat from secularism. The Crown Nominations Commission (CNC), a church panel with 16 members whose chairman is appointed by the prime minister, had been expected to pick a preferred candidate and a second choice on Friday, a church source said last week. The names were then due to be passed to Prime Minister David Cameron and Queen Elizabeth, supreme governor of the Church of England, before an official announcement within days, possibly on Wednesday. Strange, all these different election traditions. How the Holy Spirit works. How He exercise His will. And of course, the spiritual discernment of man. ‘Deadlocked’. Come to think of it, I read of no such call to fasting from the Anglicans. Instead, we have things like: Critics attack secrecy of Archbishop selection.